Patrik Lindström EBM, Electro Schwarzblut are from Netherlands and have earlier released an EP called 'Sehlenwolf' off label back in 2008. Even though they are not from Germany, all their lyrics are in German as well as their band name and album names. They have recently been picked up by Alfa-Matrix and now release their debut album. 'Das Mausoleum' opens up explosively with the track "Sterbelied", hard techno beats and Zeon's raw and intense voice seems fresh and right on track, not changing course for anything. It's soon accompanied by Angelika's soft female touch and you got a classic beauty and the beast drama. This layup goes along with the second track "Die eine Klage" and so far I'm blown away. To my grief, they do not keep the set path and head straight into the all too well known paths of dark electro and suddenly it does not feel so fresh anymore. It gets better with the 7th track "Gewitter" that also becomes a favourite, but all in all, the immersive and aggressive start is lost. 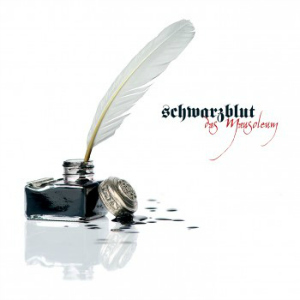 Schwarzblut are from Netherlands and have earlier released an EP called 'Sehlenwolf' off label back in 2008. Even though they are not from Germany, all their lyrics are in German as well as their band name and album names. They have recently been picked up by Alfa-Matrix and now release their debut album. 'Das Mausoleum' could be a 2010 favourite, but got lost at sea. Hopefully they focus more on the things they do really great in their second release, which is hard, aggressive electro dance music.